This property at 24 Hemlock Crescent SW2402 , Calgary, ABT3C 2Z1 has listed by Sheri-Lee Presenger but has not been updated for quite some time. Please contact the listing agent and broker for up to date information. Amazing Penthouse Condo with breathtaking VIEWS of the Downtown Skyline, overlooking the peaceful grounds of Shaganappi Golf Course. The inviting foyer greets you with gleaming Italian MARBLE tile that flows into the dining and living and kitchen areas. The chefs kitchen is finished with granite countops, cherry stained cabinets, wine fridge, Bosch dishwasher and an Ultraline gas stove. The living room has a second gas fireplace with access to a MASSIVE deck, that is your own private outdoor Oasis with room for relaxation and entertaining while enjoying DOWNTOWN VIEWS on the 600 sq ft deck. Amazing Penthouse Condo with breathtaking VIEWS of the Downtown Skyline, overlooking the peaceful grounds of Shaganappi Golf Course. The inviting foyer greets you with gleaming Italian MARBLE tile that flows into the dining and living and kitchen areas. The chefs kitchen is finished with granite countops, cherry stained cabinets, wine fridge, Bosch dishwasher and an Ultraline gas stove. The living room has a second gas fireplace with access to a MASSIVE deck, that is your own private outdoor Oasis with room for relaxation and entertaining while enjoying DOWNTOWN VIEWS on the 600 sq ft deck. The master bedroom features a LARGE walk-in closet and a gorgeous ensuite with his and her sinks, 3 sided fireplace and large soaker tub. The second bedroom has its own private balcony with views. Complimented by plantation shutters throughout, in suite storage and front load laundry, THREE titled parking spaces close to elevator (washbay access) and TWO storage lockers make this gorgeous condo a hit! The master bedroom features a LARGE walk-in closet and a gorgeous ensuite with his and her sinks, 3 sided fireplace and large soaker tub. The second bedroom has its own private balcony with views. Complimented by plantation shutters throughout, in suite storage and front load laundry, THREE titled parking spaces close to elevator (washbay access) and TWO storage lockers make this gorgeous condo a hit! 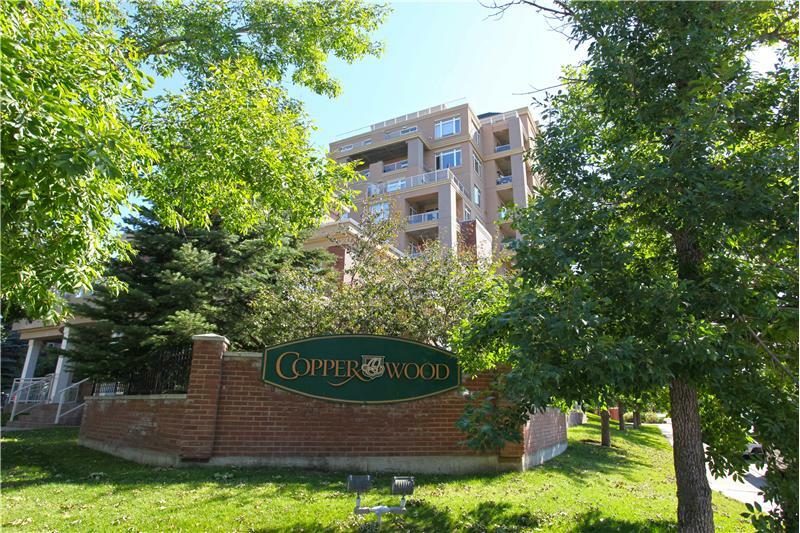 Located in the Copperstone Condominium Complex, with amenities that include a car wash in the underground parkade, a fitness facility, 3 titled parking spots & 2 large storage units, separate bicycle storage. Views of the downtown skyline & Shaganappi Golf Course from nearly every room!